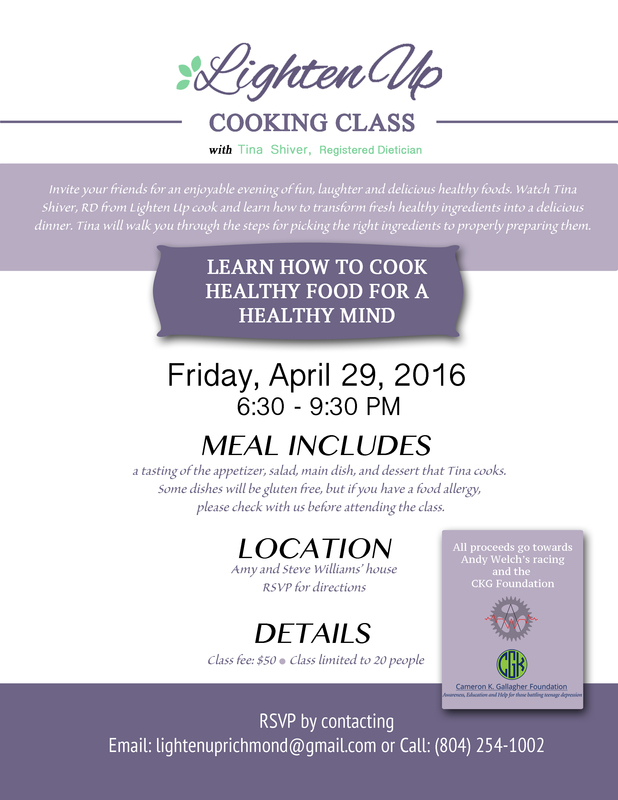 Cooking Class to Benefit Andy Welch Racing and the CKG Foundation! Merry Christmas Eve, dear readers! It’s an unnaturally warm Christmas here and across the east coast, but we know you’re in a festive spirit. Tina will be heading to a Christmas brunch, and we thought we’d share her contribution. As always, you can trust that this dish is healthy, so have a heaping helping! Besides being beautiful (we’re loving the red and green), you’ll get a flavorful boost from these veggies and kale, as it’s full of antioxidant nutrients, vitamins and minerals. Not only will you get a helpful boost to your immune system, but the fiber will reduce temptation to consume too many of those sweets later. 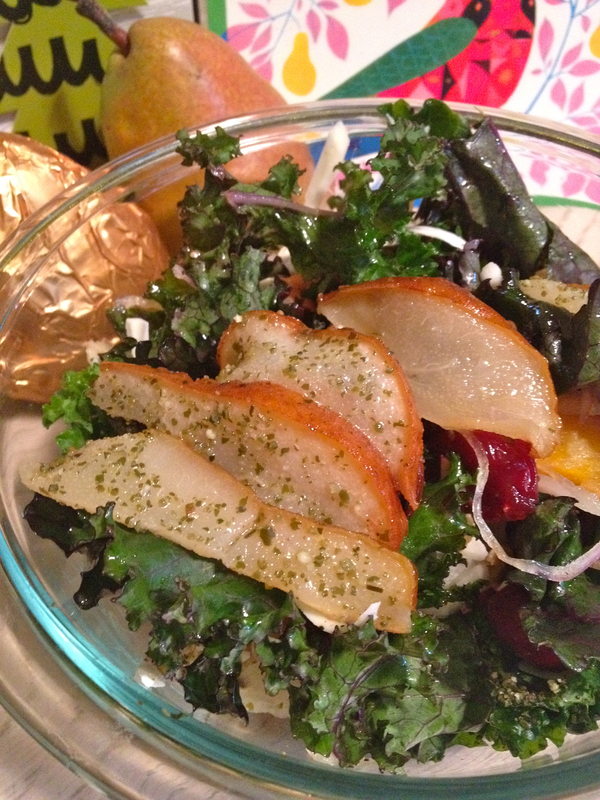 This combination of veggies is particularly delicious, the kale gives a full-bodied base and the roasted pears topped with kelp granules are a sweet surprise on top. This one’s sure to be a hit, so bring it along with you and enjoy the extra after the holiday craziness calms down! Take the cranberries and cubed butternut squash and place on parchment paper on a baking sheet. Drizzle with grape seed oil (about 1-2 tsp) plus 1 tsp. honey. Bake until butternut squash is roasted and soft. Place sliced pear in baking pan and place in oven and roast at 350 degrees until pear is roasted through about 15-20 minutes. 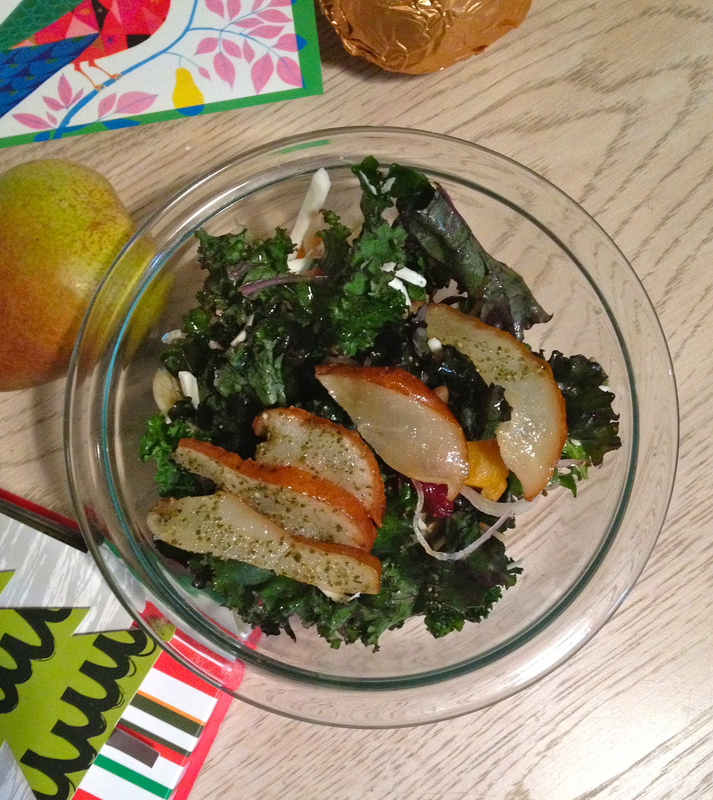 Place kale in a bowl. Add onion, jicama, fennel, pumpkin seeds, butternut squash and cranberries. Squeeze the orange over the salad and add olive oil. Mix thoroughly. Add grated cheese. Add pepper to taste. Top with pears and sprinkle with Kelp granules. 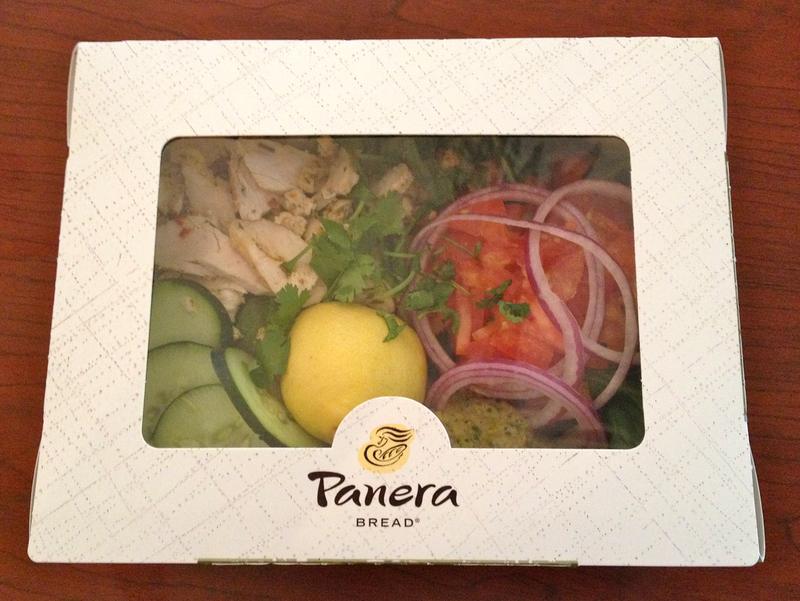 We had an absolutely overwhelming response from our clients on that last post about Panera. Making food at home is always the best option, but everyone needs a break now and then. Our clients do a wonderful job of staying disciplined and keeping their eyes on the prize, and we know they deserve a reward. How long can one shy away from the office deciding to order out together? or avoid going to dinner with friends for fear of breaking the rules? Oh boy. Is your mouth watering yet? As if their Mixed Garden Vegetables with Basil Oil kebob wasn’t delightful enough, they also offer an amazing Chicken Breast with Fresh Herbs kebob. These are the two Tina would highlight at Sticks. They are delicious and even more delicious together. Sticks makes a tasty little side of cucumbers, tomatoes and other delights, and we think that rounds out the meal pretty well. 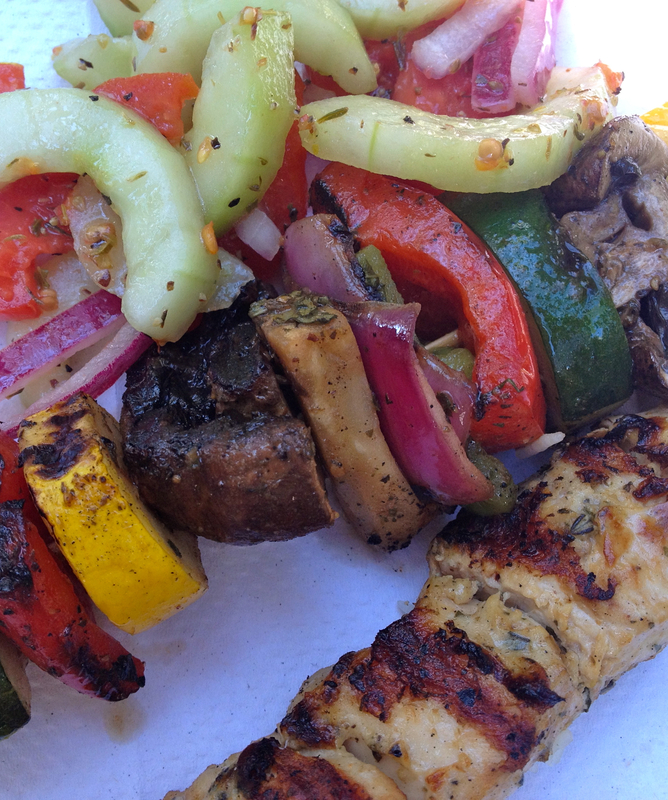 Grilled veggies and meats seem the obvious choice for healthy options, but the savvy restaurant-goer has to be careful. We were surprised, once we really started researching, at how many dishes are wayyyy too high in carbohydrates, overall calories and sodium (good grief, so much sodium). With this combo, though, Tina found she could get the protein she needed at lunch time as well as our old friend low glycemic index carbs through the veggies. The extra fiber doesn’t hurt, either. What Tina really enjoys here, though, is the healthy fat that is included without the heavy cost of loads and loads of sodium. Total sodium for these two together is 175 mg. Sticks has a shrimp platter which looks awful tempting (Stephanie was this close to ordering that), but with 1,270 mg of sodium it’s not quite worth it at half of your sodium need for the day. Tina’s only complaint is that the fiber could be a little higher. 3 grams isn’t so bad, but she will have to make sure to include 22 grams more during the day so meet the daily recommendation of 25. If you’re in Richmond, Charlottesville or Williamsburg, check this place out. At Willow Lawn the staff is exceedingly friendly, willing to offer suggestions about their favorite items and preparing meals quickly. Before you go, take a glance at their nutrition information, and try to make sure your selection matches those of these two kebobs in protein, carbs, and sodium. They also offer a little side salad to enjoy with your kebob choices, which Tina gives a thumbs-up. 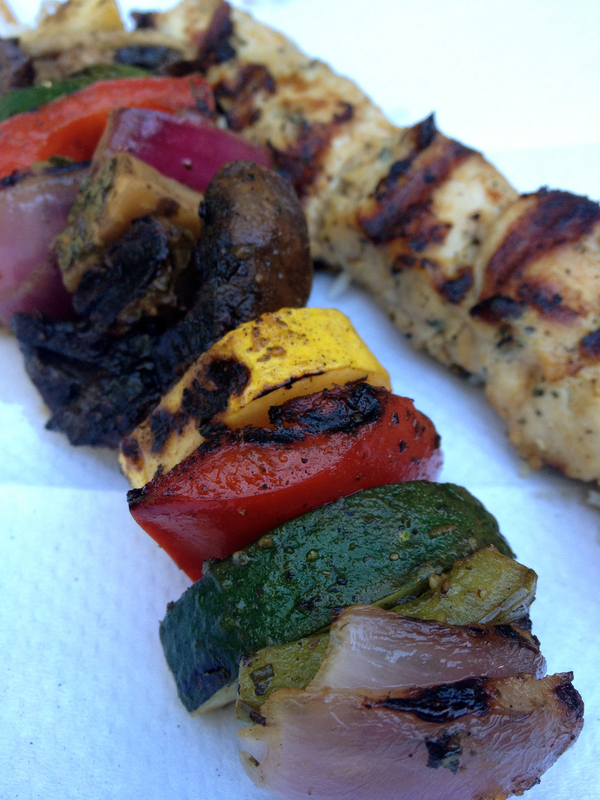 The Mixed Garden Vegetables with Basil Oil kebob and the Chicken Breast with Fresh Herbs kebob get an A-. 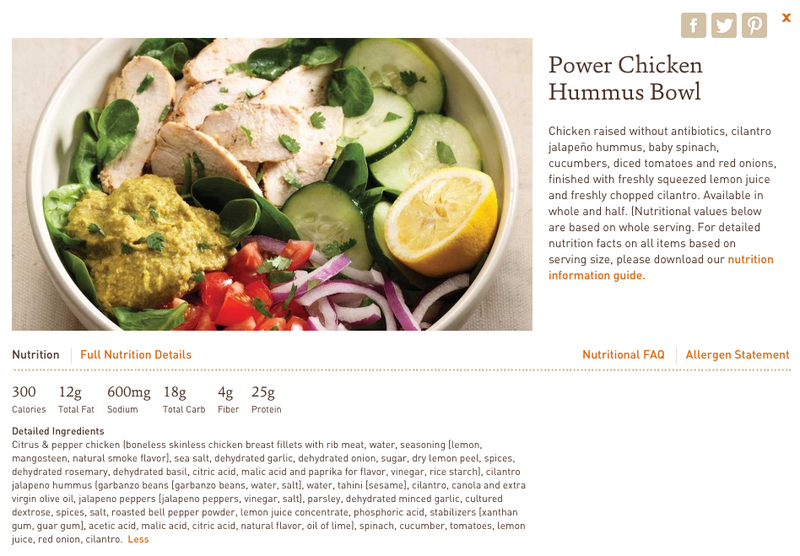 They may be no Power Chicken Hummus Bowl, but as far as we’re concerned, still a great option. Enjoy! 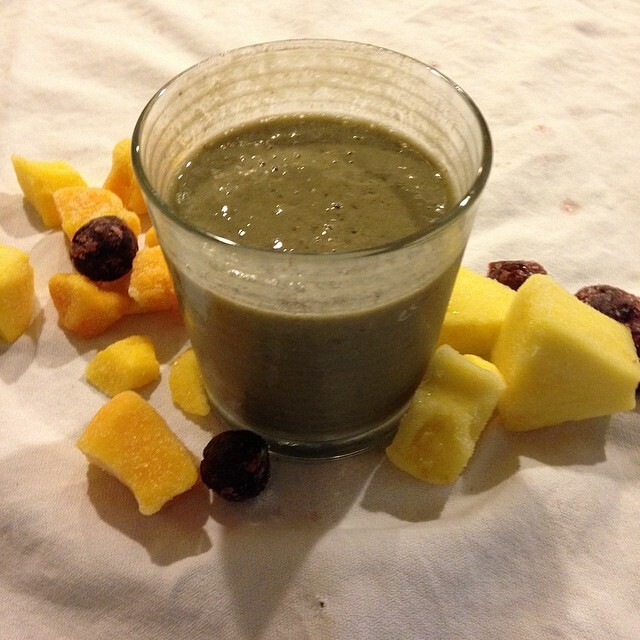 About ten years ago Tina started a detox with a colleague who practices Chinese Medicine. Combining his expertise with Tina’s in Functional Medicine, the program was referred to as an “East Meets West” sort of philosophy. Chinese medicine teaches that warmer foods are better to have in the morning in order to avoid shocking the system with something like cold cereal or yogurt; Functional Medicine celebrates the health benefits of gluten free oats, millet, buckwheat and amaranth, which are full of fiber, nutrients and protein, all with a lower glycemic index. So here we are with a perfect East-meets-West breakfast that satisfies both philosophies, and will start your day right on a chilly fall morning. 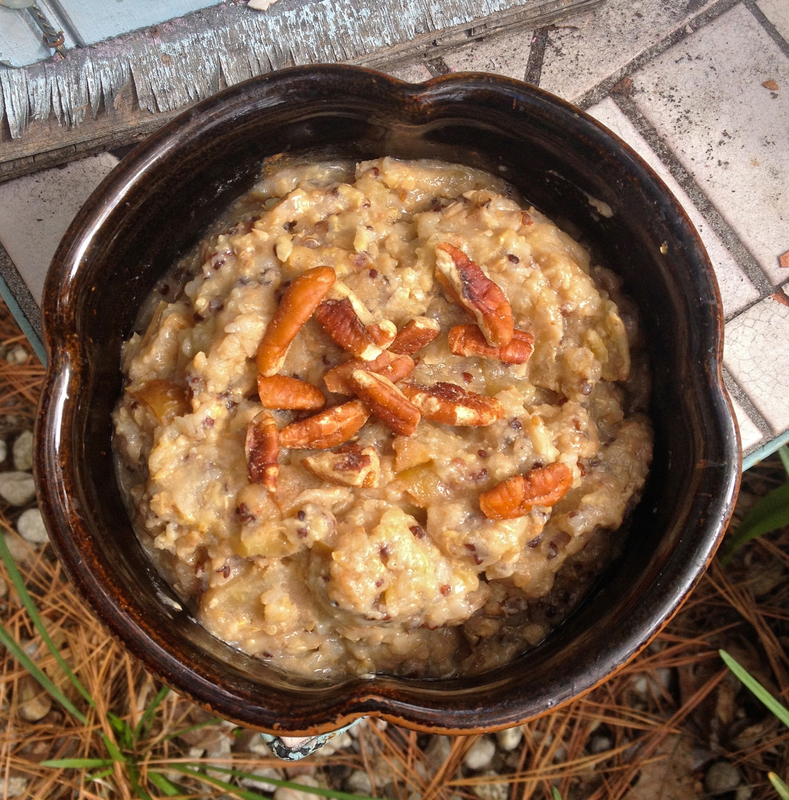 Tina’s tip: top this oatmeal with walnuts for a boost of good fat and protein… not to mention a satisfying crunch. Add all ingredients to the crockpot the night before. Turn on low and it’s ready the next morning. 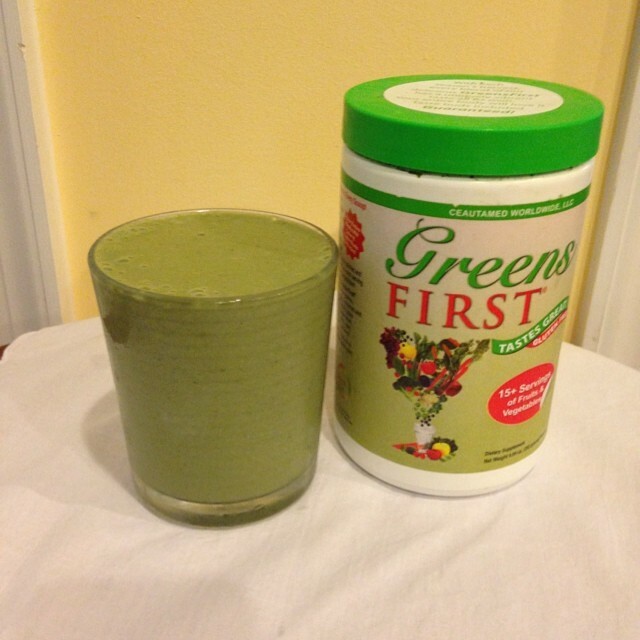 So drink up these veggies and enjoy this cold refreshing recipe! Put into Vitamix or blender and blend until smooth. In a pan add brown rice syrup and almond butter. Place on medium meat and allow to mix together and become creamy. 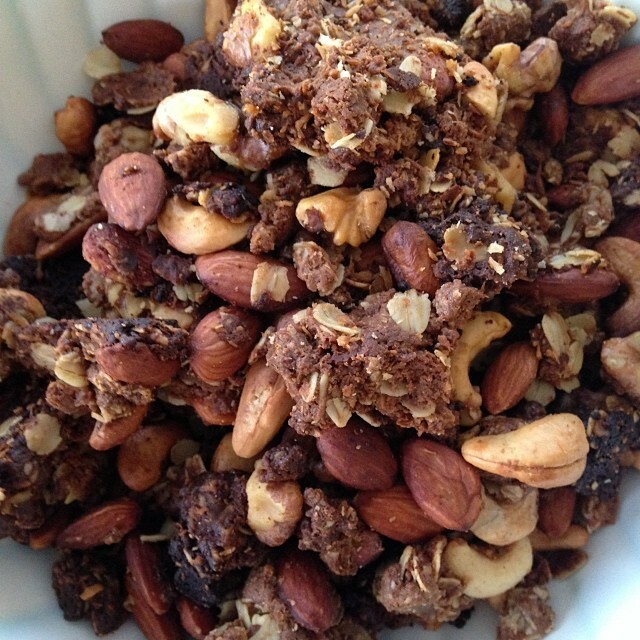 Add nuts, oats and coconut to a bowl and mix together. Once the liquid ingredients are mixed together add to the nut/oat mix. Place parchment paper on a baking pan. Spread mix on the baking pan and bake for about 30 minutes. We don’t mean to jump on the “eat healthy during the holidays” bandwagon, but really, we should. We’ve got nothing against mashed potatoes and stuffing, the treats we expect and desire when the weather turns cold; but allow us to offer a tasty suggestion. Enjoy your conservative helpings of Thanksgiving favorites, and try something new with our amazing cornish hen dinner, complemented by a beet salad and sweet walnut acorn squash. 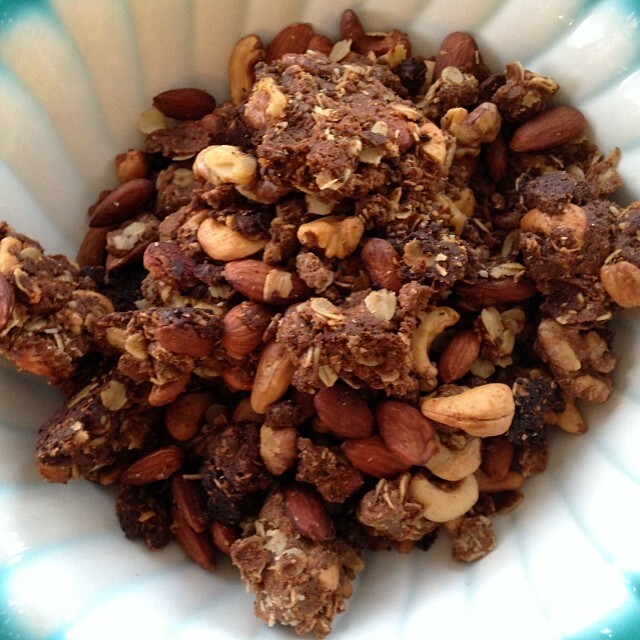 As usual, Tina has completed plenty of research and hours or experimenting to come up with a snack that will thrill the tastebuds and avoid that post-turkey stupor by fueling your body in a healthy way. 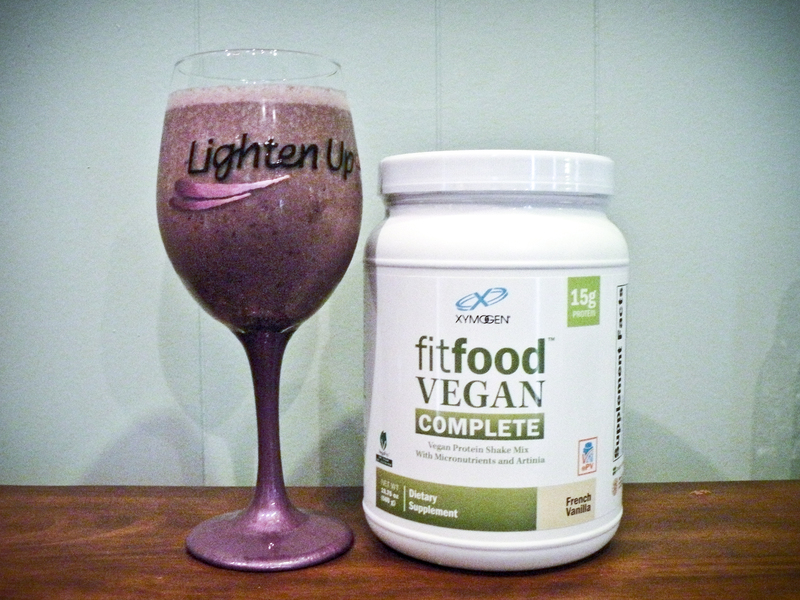 These items together contain all the macronutrients: protein, carbohydrates and fats. For those of you who haven’t yet tried a recipe with cornish hen, let’s just say you’ve GOTTA do it. It’s absolutely delicious. The flavor is subtle, a little sweeter and more dense than chicken, and is simply delicious with the garlic and rosemary in this recipe. 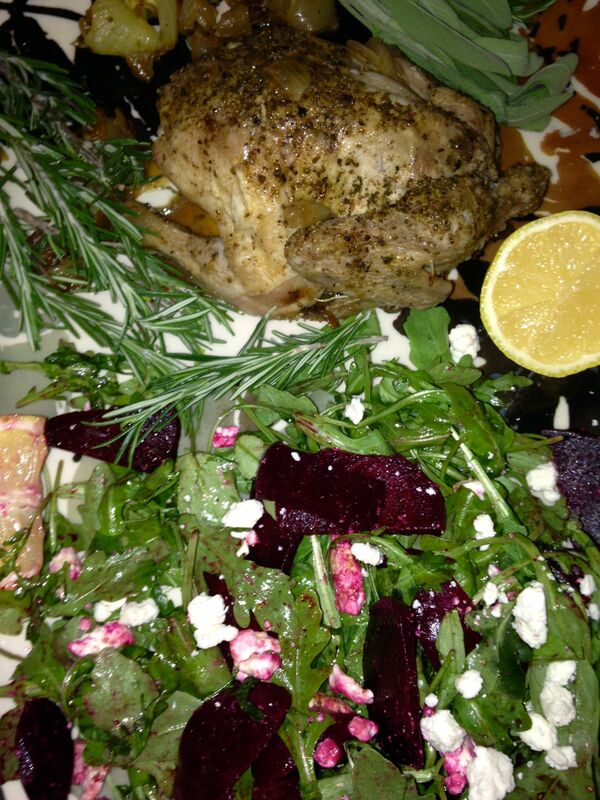 The beet arugula salad packs a punch for your senses, a surprising contrast to the gentle cornish hen. We absolutely loved the sharp flavor of the greens with goat feta cheese sprinkled on top (quite liberally, in Stephanie’s case). The benefit here is a decent amount of vitamins C and K, along with iron and beta carotene, but let’s not focus on that stuff during Thanksgiving. 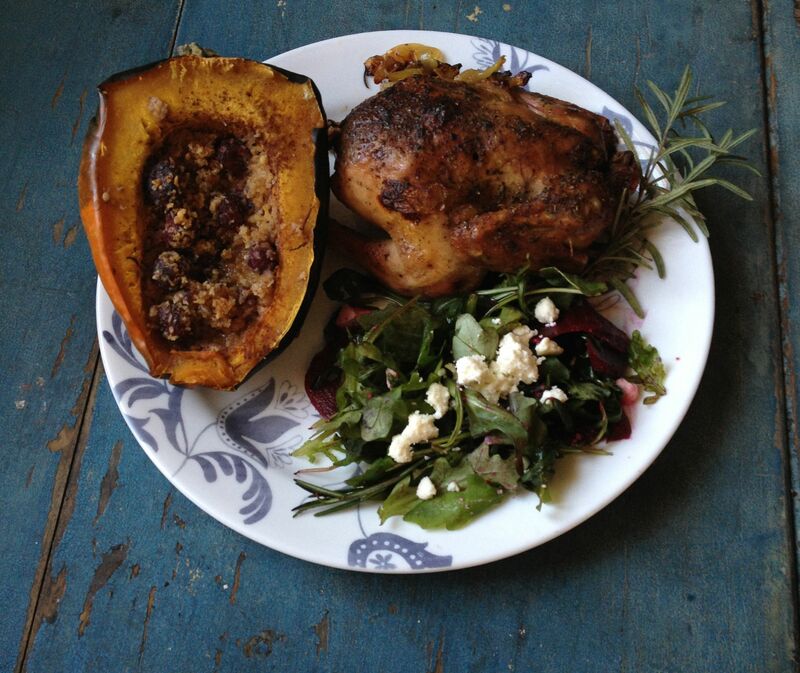 Along those lines, Tina includes an absolutely amazing sweet acorn squash that’s sure to please. In addition, we’ve included a recipe at the end for a gluten-free pie that features coconut and pumpkin. Enjoy these elements together in a well-rounded meal, or bring one thing with you to the family party. Either way, you can wow your loved ones with the idea that healthy can taste good! Use this holiday season to begin a new era in your life involving wellness and healthy living- you’ll be sure to have some company in that once your friends give this recipe a try. Wash the cornish hens. Pat dry. Pour 1 tablespoon of the buttery olive oil on each cornish hen, then salt and pepper. Stuff each cornish hen with 1/2 of the onion and 2 garlic cloves. Add 1 sprig of rosemary and thyme to each hen. Place in a dutch oven and bake, covered, for 1 hour. Preheat oven to 350 degrees. Place acorn squash on a pan and bake until you can put a fork through it, about 30 minutes. Split the acorn squash in half and scoop out the seeds. Place 1/2 tablespoon of the butter in each half of the squash. Sprinkle with cinnamon and nutmeg. 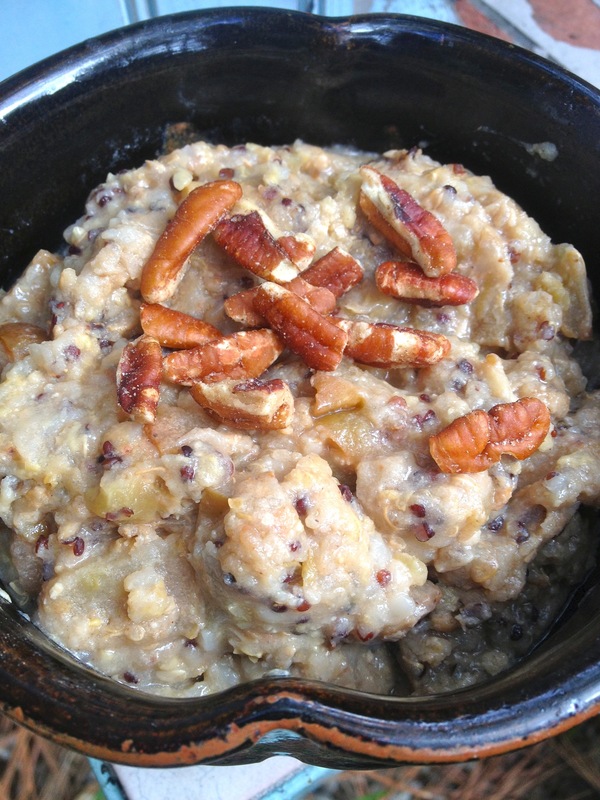 Place the coconut and walnuts in a food processor and pulse until the walnuts are minced. Add coconut sugar or truvia and continue to pulse. Add 1/4 cup of coconut mix to each squash. Place squash in a baking pan that has about 1 inch of water. Cover with aluminum foil and bake until squash is soft, about 20 minutes. Maple Balsamic Vinegar – I use Taproom…..
Place arugula on a platter. Top with fresh beets. Add the feta/goat cheese. Season with salt and pepper. Pour the olive oil over the salad mix first followed by the Maple balsamic vinegar. Put the pumpkin, truvia and spices into a food processor and blend well. Add the coconut cream and continue to blend. Add 2 eggs. Blend well. Pour into crust. 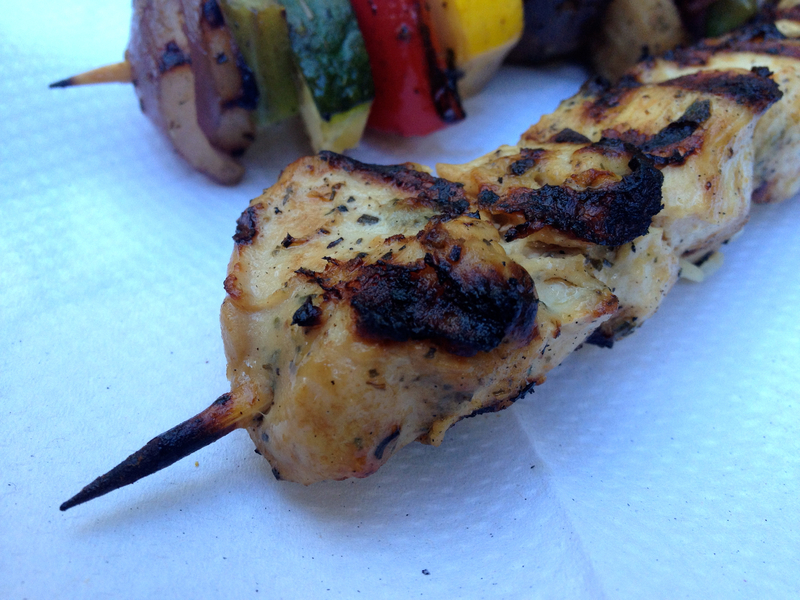 This is another yummy summer dish that comes with all the taste and zero guilt, guaranteed. It’s low in sugar and high in fiber, while the gluten-free flours are gentle on your stomach and easy to digest. This treat also contains healthy fats, including monounsaturated fat from grape seed oil and omega 3’s from the sunflower seeds. Sweet, juicy peaches meet crunchy oats in this dessert, and whether you bring it to family event or enjoy it on your porch during these last hot and sunny days, it’s sure to please. Slice peaches and place in the bottom of a 8X10 glass baking pan. sprinkle with truvia for baking. In a bowl mix together oats, teff, sunflower seeds, flax, almonds and then add the melted butter or grape seed oil. Add truvia for baking, honey and maple extract. 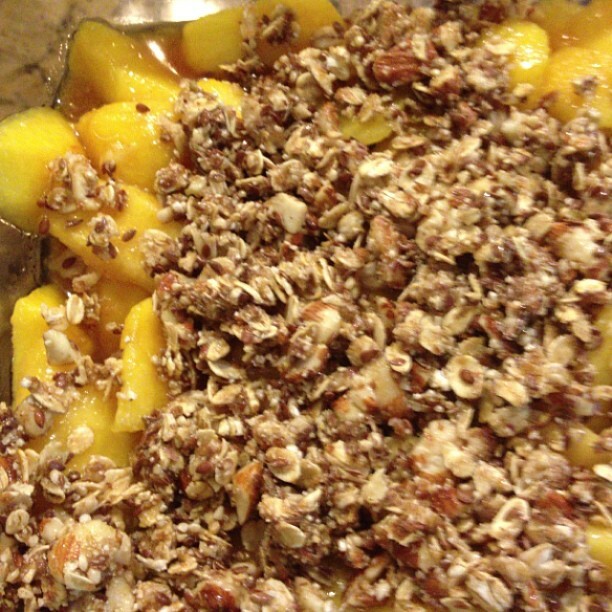 Mix together and then add as a topping to the peaches. Bake covered for about 20 minutes, then remove cover and let toast for about 10 more minutes or longer depending on whether or not the peaches are cooked through.